STRUMIS LTD is delighted to announce an initiative with the Maak Training Centre to provide local technical training facilities in Saudi Arabia. 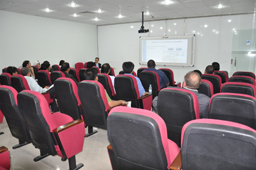 As part of this initiative STRUMIS LTD has access to the facilities at the newly opened Maak Training Centre in Riyadh, where last month STRUMIS Middle East conducted the first seminar on "How to Save Time and Money in the Steel Fabrication". This inaugural event was extremely well attended by 30 senior executives from the structural steel fabrication industry. Dr Auday Al-Rawe, Commercial Manager, STRUMIS Middle East, commented, "We are delighted to have a training partner in Maak and to provide regular seminars and training at the Maak facility". Maak is a dedicated new training centre consisting of over 1400 square meters equipped with high end hardware technology devoted to providing a specialist training service, to serve the local engineering and industrial markets. Maak will also work closely with local training institutions and ultimately aims to provide more skilled personnel to the engineering and industrial markets.